There are many harmful agents in workplace leading humans to be exposed to many known or unknown harmful agents everyday and to be affected by their adverse impacts and pathogenicity. These factors may include excessive exposure to different hazardous agents in working environments such as nonstandard noise, undesirable lighting, thermal stresses, and dust pollution. Today, noise pollution is one of the main problems in industries causes a huge number of people to be in danger of its risk factors either in their workplace or home. Thermal stress is another harmful agent in the workplace partially constituted by energy (heat) and partially originated by material (e.g., moisture). Considering the fact that the disorders and diseases due to thermal stress cause several major health problems in most of the working places, these predicaments require special attention. Moreover, different disorders occurrence in the respiratory system and other organs are originated from emitted dust in workplace. For instance, silica can be mentioned as one of the most important pollutants that have a long history in developing diseases (e.g., lung cancer). This material exists in rock mines or in the process of producing minerals, such as cement production. Definitely, identifying and assessing different physical, chemical, and biological agents in the workplace as well as preventing workforce not to be exposed to nonstandard situations are mostly the best solutions when protecting the workforce health. The severity of the harmful effects caused by each of these harmful agents depends on the type, entering route, and the amount and duration of exposure to causative agents of occupational diseases. The major problems that many industries are dealing with are the recompenses and complaints related to diseases caused by the harmful agents, and the industries have to pay heavy costs to the workers as compensation. In many cases, the exact estimation of the compensations is not possible because of the unknown exposure time to harmful agents and lack of an appropriate method to accurately assess the exposure time. It is very important that the estimations be based on the best scientific documentation and this problem is more bold in occupations that workers expose to different and various harmful agents such as repair and maintenance workers that their tasks are often unplanned and unpredictable, and there is no pattern to estimate the exposure time while a technical malfunction occurs in the process or equipment, considering that the most repairing processes are not standardized and in written form. In occupational health, it is attempted to identify the various risks, compare them with the threshold limit value announced at certain intervals by the Ministry of Health and Medical Education, and control them whether they are higher than the permissible limits. There is an important question that the occupational health has not answered so far is how to control and evaluate such jobs with exposure to different and various harmful agents. Currently, there is no systematic method to estimate the time of exposure and no certain suggestions have been made in this regard so far, and this has always been one of the most important and challenging topics for the occupational hygienist. Regarding other sciences perspectives, such as industrial engineering, suitable solutions like using standardized methods of time study as an appropriate choice can be considered to solve this problem, of course, due to the need for an industrial engineer, there are some limitations in utilizing them. Considering the continuous developments in electronic science, technologies that are designed and built for other purposes can be used for this purpose. One of these technologies is radio-frequency identification (RFID) system that can be a potential solution to this problem. The use of RFID systems can help to estimate the exposure time of workers. In this study, the researchers decided to design an RFID technology-based electronic circuit for the first time to evaluate using RFID technology to assess the time of exposure to occupational harmful agents. Using RFID allows the occupational hygienist to know where the workers are in production line and what times are in that workplaces in their work shift. The history of RFID technology back to World War II when in 1939 Britain used another technology, similar to RFID called identifying friend or foe (IFF) system, to identify enemy aircraft. RFID technology is used to identify and track a person, object, or an animal without using the human workforce to read and to record the data and can perform data management, authentication, and tracking simultaneously., Moreover, through the unique capability of identifying each item without any direct vision constraints, it allows the immediate collection of data and the identification of the target. As a result of numerous benefits such as costs reduction, increased speed, and large scale of identification, this technology attracted a huge deal of attention and its application scope is extended day by day. Today, we see the development of this technology, which is used in various industries such as mobile phones, computers, personal identification cards (chip injection under the human skin), and so on. RFID applications are enormous, and it can be used in any process that identifies and works with the flow of data. Based on the searches, we found no study about application of RFID in health. This research is an applied study that was carried out experimentally in an industry in Isfahan province, Iran, in 2017. Due to the lack of any study in this field and no guidance for selecting the number of samples, this study was conducted as a pilot study under a statistician's opinion on 29 persons simple randomly selected with 130 repetitions among workers without a fixed exposure pattern to causative agents of occupational diseases in the workplace. Initially, a group of workers consist of workers without a fixed pattern of exposure including repair, facilities, technical, services, quality control, and etc., selected. In the next step, during the sessions, the related training was provided to the group members by the occupational hygienist. To reduce the errors, each worker worked with the device several times before the study began. Demographic data of the participants were recorded through interviews with the workers and were registered in the software. All measurements were made in the morning shift work. The data gathering tool included a special industrial engineering time study form and a device made by researchers to measure the exposure time. Occupational exposure time to harmful agents was measured by two methods. The first method was based on using the made device and conducted by the worker and the second method was based on the industrial engineering time study through the stopwatch method, which was carried out by the occupational hygienist. Then, the results of the exposure time measured by the worker were compared with the results obtained by the occupational hygienist, and the accuracy of the data declared by the worker was developed and validated by the data measured by the occupational hygienist. The results were analyzed using SPSS 20, descriptive statistics, Spearman correlation coefficient, and Paired samples t-test. Back-end system (their associated antennas). This system works in a way that each tag is assigned a unique identifier and when an identifier is placed within the radio signal range of a data reader device, it is activated under the electromagnetic field and sends its data to the data reader (or, in other words, the data reader receives the data of the identifier) and transmits them to the server which it is connected to, and the data about all the tags are stored in a secure and large memory. An RFID system is show in [Figure 1]. An RFID reader can read thousands of tags in 1 s, and it does not matter whether the detectable item is in motion or stagnation or in dusty, foggy, damp, rainy, snowy, sunny or dirty environment and rusty surfaces because none of the mentioned conditions can affect the performance of this system. The data stored on the RFID tag in any object can be sent to different equipment, simultaneously through physical barriers and remotely. These tags can also be installed on metals, can withstand temperatures up to 200°C and have a long life span and they are not sensitive to dirt. The device made by the research team is based on RFID technology so that a card was defined for each worker and the readers were placed in different workplaces. Readers were in three different types including short, medium, and long range, which were selected considering the distance from the main receiver so that for short distance from the main receiver a reader with shorter range was used. Before entering to any part of the workplace and before starting work, each worker first inserted the card to the reader device placed in that part of the workplace and the worker's login was recorded (the device beeped three consecutive times and a flashing light was lit). After completing the work, the worker inserts his/her card to the same device again, and this time the worker's exit was recorded (in order to record the exit, the device beeped twice and the flashing lights were lit). Hence, after each login, we will have an exit. At the workplace, also a central system was installed that received reader data online and through WIFI, all the readers sent the data to the central system. [Figure 2]. To receive data from the receiver, a software was designed that stored all the data and the time between the login and exit of the worker was calculated and recorded as time of exposure to harmful agents. Reader and receiver are shows in [Figure 3]. Time study includes the use of the correct methods and the application of scientific principles, in order to determine the timing of an operation performed by an eligible worker at the optimal level of performance. This method is one of the most important time study systems which the time study is performed during the working cycle, through direct observation. In this method, the observer, a person who knows time study methods, using the required equipment, reads the raw time from the stopwatch and recorded it in the timetable form. At the same time, the occupational hygienist measured the exposure time by stopwatch. In such a way that once the worker began to work, his/her login to the workplace was recorded and the exit of the worker was recorded as he/she left the workplace. The time between the login and exit of the worker was calculated as the exposure time. This study was performed on 29 participants with 130 replications for all of them, among the workers without a fixed pattern of exposure, with a mean age of 36.48 ± 5.889, and a job experience of 9.06 ± 6.316 years. The demographic data of the participantsare shown in [Table 1]. 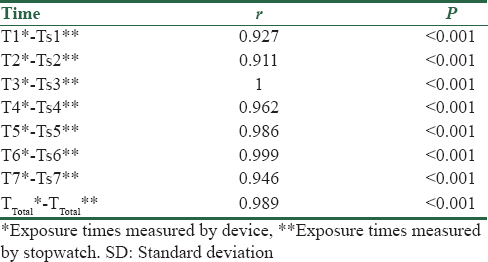 The average time of exposure to harmful agents in each zone measured by the two methods of made device (by the worker) and the stopwatch (by the occupational hygienist) is presented in [Table 2] and [Table 3]. 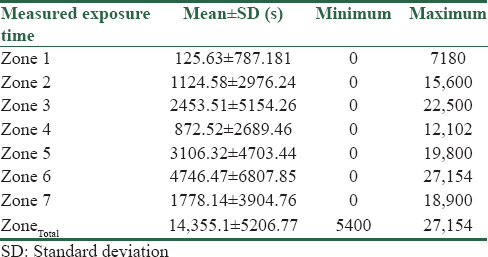 The exposure time measured by two methods of device and stopwatch was analyzed using Spearman correlation test. Spearman correlation coefficient [Table 4] shows that there is a significant correlation between the exposure times measured by the workers and occupational hygienist in each zone and in all the zones. Paired-samples t-test shows that there is no significant differences between mean exposure times measured by the workers and occupational hygienist in each zone and in all the zones (P > 0.05). The main purpose of this research was to design, present, and utilizes a radio-based device to estimate the pattern of exposure time to harmful agents in the industry and as the most important applied purpose, a systematic and precise method is provided to assess the exposure time of workers to harmful agents. The results indicated that the use of RFID technology could be very effective in evaluating the exposure time of workers to causative agents of occupational diseases in the workplaces. On the other hand, in numerous studies related to production processes, the stopwatch method (or other time study methods) was used. In a study of Ebrahimipour et al. stopwatch method was used to investigate the waiting time for discharged patients. Moreover, in a study conducted by Yousefi et al., using stopwatch, the total workload of the employee in hospital was evaluated. No studies were performed on the use of RFID in occupational health. The present study utilizes RFID to solve one of the most important challenges in occupational health. Although this technology was used for the first time for this purpose, however, it has a very high potential for assessing the exposure time. There was a significant correlation between the exposure times measured by the worker and the occupational hygienist in each zone and all the zones (P < 0.05) and R in all zones was higher than 0.9). On the other hand, the use of this technology is challenging, especially the experience of using it is limited. In addition, the adaptation of RFID technology to workers and the acceptance of it, the fear of controlling the worker and losing their jobs or job positions, lack of familiarity with this technology, and forgetting to insert the card were the other important problems using of this technology in this new application. Moreover, lack of a study in this field was one of the most important limitations of this study. One of the problems observed in this study was forgetting to insert the card. To solve this problem, it is recommended to use active tags, which are very small and can be installed on the worker's clothes, so the entering and leaving of the workers are automatically registered thus no need to insert a card. Moreover, there are some difficulties to implementation of new technology that should be removed by the support of managers and relevant officials, and to eliminate the resistance of workers to the implement the new technology, it is recommended to involve the workers in planning and performing and familiarize them with the new technology and using method through training and increasing skills, thus the fear of losing their job positions will be reduced. Further studies and a review are suggested to examine the difficulties and limitations of this technology in occupational health. According to the results, it can be concluded that this technology RFID can desirably be used to evaluate the exposure time of workers to causative agents of occupational diseases, and following the first step, it will be possible to carry out a precise risk assessment and control the harmful agents of the workplaces of such occupations. Moreover, by monitoring the time spent on manufacturing processes, hidden work breaks that reduce productivity in the industry can be prevented. Finally, in the emergency and unforeseen events requiring the discharge of the workplaces, this device can provide a list of persons who are at workplace and not exit to the emergency control team. This work was financially supported by the Medical University of Isfahan city of Iran. 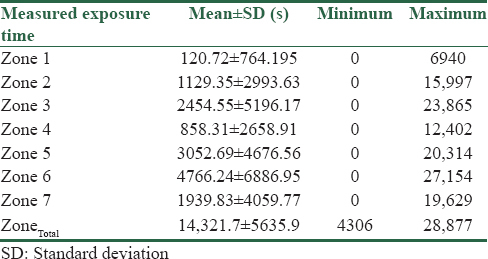 Khanijazani R, Tabatabaeii S, Seyed Mehdi S, Kavousi A. Ergonomic study of the relationship between job stress and harmful factors in the cement industry. Iran Occup Health 2016;13:58-67. Dehghan H, Mortazavi SB, Jafari MJ, Maracy MR. Evaluation of wet bulb globe temperature index for estimation of heat strain in hot/humid conditions in the Persian Gulf. J Res Med Sci 2012;17:1108-13. Golbabaie F, Eskandari D, Azari M, Jahangiri M, Rahimi A, Shahtaheri J. Health risk assessment of chemical pollutants in a petrochemical complex. Iran Occup Health 2012;9:3. Landt J. The history of RFID. IEEE Potentials 2005;24:8-11. 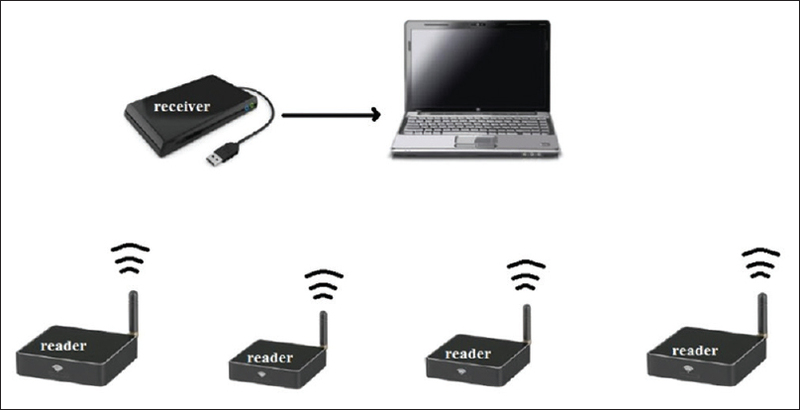 Weinstein R. RFID: A technical overview and its application to the enterprise. IT Prof 2005;7:27-33. Ansari R, Mehraeen E, Sabahi A. Need and priority assessment of Kerman's teaching hospitals to implementation of RFID technology. J Health Biomed Inform 2015;2:141-8. Fanberg H. The RFID revolution. Mark Health Serv 2004;24:43-4. Jahromi HM, Mosalanejad M. Explaining and analyzing RFID technology in the development of information technology engineering (IT); education, application and challenges. Iran Eng Educ Q 2008;38:137-68. Henrici D. RFID Security and Privacy: Concepts, Protocols, and Architectures. Germany: Springer, Science and Business Media; 2008. Gandino F, Montrucchio B, Rebaudengo M. Tampering in RFID: A survey on risks and defenses. Mob Netw Appl 2010;15:502-16. Pátkai B, Theodorou L, McFarlane D, Schmidt K. Requirements for RFID-based sensor integration in landing gear monitoring – A case study. Power 2007;5:4. Raei AA, Kamalabadi E. Application of radio waves identification system in the integrity of supply chain management (SCM). Seminar Logistics and Supply Chain; 2005. 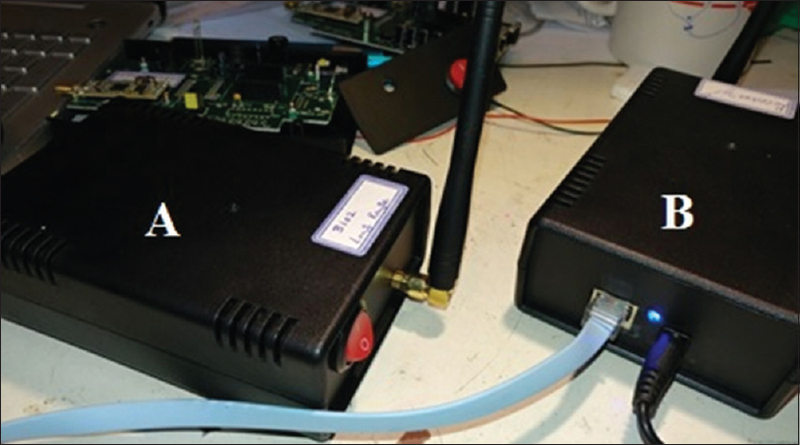 Baradaran J, Shakeri M, Khodabakhshian R. Application of RFID to monitor greenhouse conditions. First National Hydroponics Congress and Greenhouse Products. Vol. 10. 20: Iran. 2009. p. 56-7. Aliahmadi AR. Work Engineering & Time Management. Iran University Science & Technology: University Science & Technology; 2014. p. 774. Ilie-Zudor E, Kemeny Z, Egri P, Monostori L, editors. The RFID technology and its current applications. Conference Proceedings of the Modern Information Technology in the Innovation Processes of the Industrial Enterprises (MITIP); 2006. Yao W, Chu CH, Li Z, editors. The use of RFID in healthcare: Benefits and barriers. RFID-Technology and Applications (RFID-TA). 2010 IEEE International Conference. IEEE; 2010. Yao W, Chu CH, Li Z. The adoption and implementation of RFID technologies in healthcare: A literature review. J Med Syst 2012;36:3507-25. Mareshi N. Work and Time Study. Tehran: Karafarinan Basir; 2001. p. 448. Ebrahimipour H, Vafaei NA, Nouri GA, Esmaeili H, Jamili S. Studying Waiting Time of Patient during Discharge Process in Clinical Departments of Imam Reza Hospital affiliated with Mashhad University Of Medical Science In 2014;2015. Yousefi M, Ahmadi M, Fazaeli S. Staff management based on performance: Application of a work measurement model in hospital. J Payavard Salamat 2014;8:79-89.